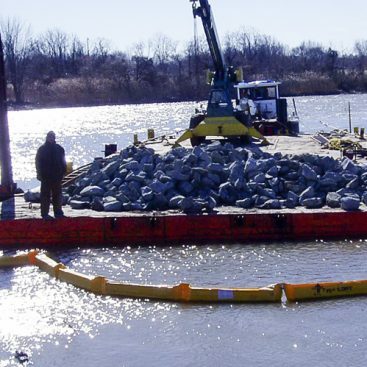 The Baltimore District of the US Army Corps of Engineers chose Geo-Solutions to perform a major land restoration and constructed wetlands project in the Chesapeake Bay. The location, on Hart-Miller Island, a 1,000 acre land mass once separated by storm events into two separate islands, Hart Island and Miller Island respectively. For decades, the shoal carved by tidal surges and erosion has been the repository for dredged spoils generated by the routine clearance of the shipping channels in the Chesapeake Bay and Baltimore Harbor. Hart and Miller Islands are now reunited by this spoil depository in the Bay about three miles northeast of the mouth of the Back River, opposite Hawk Cove. The South Cell Restoration Project primarily managed by the Corps of Engineers, was a collaborative effort with Geo-Solutions as the prime contractor, and included other state and federal trustee agencies as well as private stakeholders. The Maryland Department of Transportation Port Administration, the Department of Natural Resources, and Maryland Environmental Services (a non-government agency managing the ongoing dredging operations) were onsite working together to implement the restoration tasks and habitat construction designed by Baker Engineering. The work was intended to help stabilize Hart-Miller Island by replicating a natural functioning tidal mud flat within the island, and to provide perimeter upland berms on the bay sides to shield from wind and storm erosion. Under normal circumstances, daily tidal flow will sustain the low salt marsh habitats and flora. However, an elaborate irrigation and water control system was constructed by Geo-Solutions to ensure that the wetland hydrology would be maintained in the event of severe flooding or drought. In addition to the landform shaping, water management, and planting associated with habitat construction, Geo-Solutions also built access roads, walkways, shelter buildings and modifications to existing structures as part of its contract. Because of military training and production activities in and around the dredged source areas dating back before WWII, all of the grading materials within Geo-Solutions’ limits of excavation had to be screened and cleared for the potential existence of unexploded ordnance. Construction commenced in early autumn of 2002, and was completed in the summer and autumn months of 2003, as the seasonal germination and planting cycles of the various species determine. 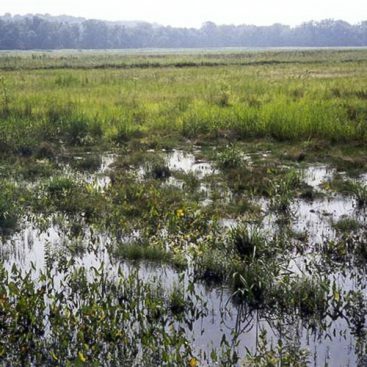 Now finished, 300 acres of upland buffer, low marsh tidal flats, and interior ponds on Hart-Miller Island are feeding habitat and nesting grounds to ducks, geese, shorebirds, and wading birds as well as fish breeding waters and oyster beds. We at Geo-Solutions take special pride in winning this contract award because our selection was in part based on successful past performance, experience and capabilities in habitat construction, wetlands restoration and our expertise completing island projects.